This exclusive IP conference is specially designed for intellectual property professionals, academicians, students, and people from the corporate sector involved in Intellectual Property. The principal focus of this conference is to provide a suitable and conducive platform to discuss, debate and present contemporary research in the area of Intellectual Property Rights and its management. 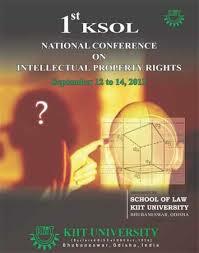 Intellectual Property Right has created a niche for itself in the field of law. It has become a promising domain for the students in universities where it is offered as a full time course, as it’s a new avenue for applied law. This conference would give an opportunity to these students to interact with the specialists. The Conference will aim at focusing different facets of Intellectual Property law in the area of patent, trademark, copyright, trade secret, sports, entertainment, technology transfer issues etc both at the national and international Intellectual Property Regime. The conference will provide an ideal opportunity for emerging researchers in the domain of Intellectual Property Right to interact with experts and practitioners through doctoral colloquium, themed tracks and keynote sessions. The theme and the subthemes of the Conference has been very meticulously designed in order to attract diverse participation from academicians, practioners, researcher and students which will facilitate a good exchange of ideas relating to Intellectual Property protection and management among the different sectors. Parallel Imports: Current trend in Intellectual Property regime. Intellectual Property Asset Management: Issues related to Valuation, Securitization and Monetizing. Dissemination and Diffusion of Technology. All papers are required to be creative and original work of the author(s). Plagiarism of any kind will lead to cancellation of the paper. Co-authorship is allowed, but maximum of two authors per paper. Each Person can submit only one Paper. Author(s) are required to send their full papers along with the Abstract. The Abstract shall not be more than 300 words describing the scope and object of the paper. All papers should either be sent in Word 2003 (.doc) or Word 2007 (.docx) format to [email protected]in latest by 31st July 2013, 23.59 Hours. The subject of the e-mails should be “Final Paper Submission for 1st KSOL National Conference on Intellectual Property Rights”. The body of the mail should contain a covering letter containing the Author’s Name(s), Affiliation(s), and Full Postal Address, Email Id, And Telephone Number along with the title of the paper. Insert Name of the Author(s) in Times New Roman Script with Font Size 14, First Letter Capitalized, Boldface, Center Alignment. Then insert the Name(s) of the Author’s Institution/Affiliation and email id, in Times New Roman Script with Font Size 10. Format of the Abstract – Times New Roman Script with Font Size 12; 1.5 Line Spacing; Justified Alignment; No Paragraph indenting; Margins 1inch on all sides. The scanned copy of the registration form and the demand draft should be sent to [email protected] on or before 15th July, 2013. Online registration is compulsory for all participants in addition to sending the hard copy. First 100 entries will be given priority in accommodation. The registration shall be confirmed and the travel details shall be sought by the organizer subsequently. Accommodation and food will be provided to the participants from noon of 12th Sept, 2013 till morning of15th Sept, 2013. Previous ArticleInternship at B.P.T.P. Ltd.